A vacation home placed in the middle of a quiet rural private residence complex, with a relaxing hill top view of the surroundings countryside. Located in the middle of the Dolomites Alps and less than one Hr. from Venice. 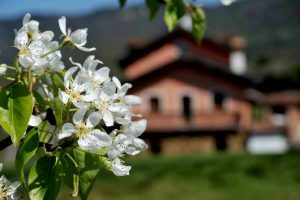 We are at the foot of the Nevegal ski resort; perfect for winter sports and for summer hiking or just enjoing the summer cool wheather. Pets with trained owners are welcomed. The house rents for E. 150,00 in low season and E. 240,00 in high season per night ; the house will accomodate a maximum of 7 persons distributed in two double bedrooms and two single bedrooms an additional folding bed is available. Baby cribs or baby beds are available as well on request. Special rates for weekly or montly stay are available. a full kitchen with working fireplace for your enjoyment or where you can barbeque and cook. A living and dining room with television. A private suite with master bedroom , balcony, a single bedroom and a bathroom. One additional bed for a child may be added to ether double rooms for free.